1. 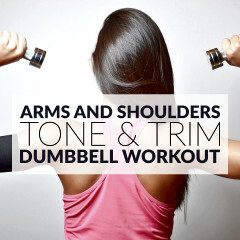 Grab a set of dumbbells and stand straight. 2. 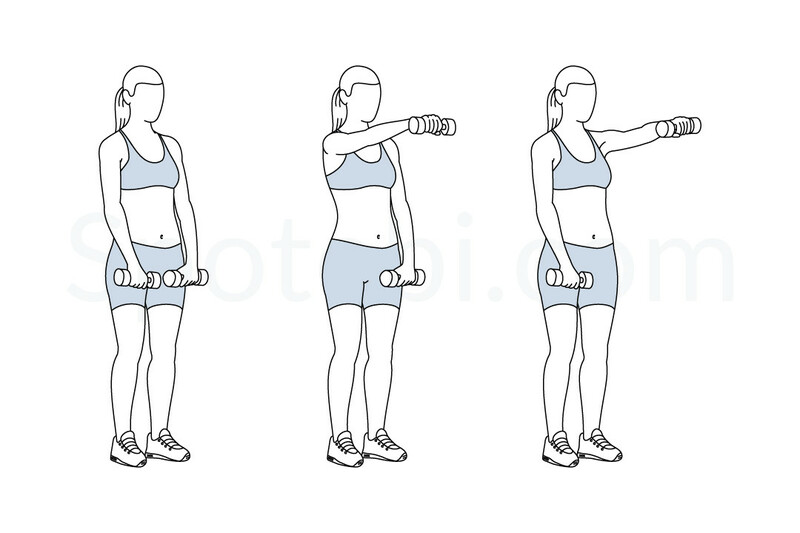 With your palms facing down, lift one dumbbell until your arm is slightly above parallel to the floor. 3. Pause and then slowly lower the arm back to the starting position. 4. Repeat with the opposite arm and keep alternating sides until the set is complete. Keep the elbows slightly bent, engage your core and maintain your back straight. Breathe out as you lift the dumbbells, keep the movement slow and smooth and breathe in as you lower the dumbbells back to the starting position. Adding the dumbbell front raise to your workout routine helps to shape and sculpt the anterior portion of your shoulders and your chest. This is a great exercise to add to an upper body strength training routine, especially if you want to target your arms and your shoulders. Do 2 or 3 sets of 8 to 16 repetitions of the dumbbell front raise. Pair this exercise with the dumbbell lateral raise and the bent over lateral raise for a complete shoulder workout.